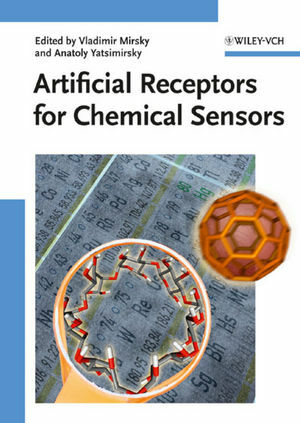 The first to provide systematically organized information on all three important aspects of artificial receptor design, this book brings together knowledge on an exceptionally hot and multidisciplinary field of research. Strong emphasis is placed on the methodology for discovering artificial receptors, with both definitions for chemosensitivity as well as experimental setups supplied. There follows coverage of numerous classes of artificial receptors, including synthesis, immobilization on surfaces, and quantitative data on properties. The third part of the book focuses on receptor arrays for artificial nose and tongue applications and the whole is rounded off with an outlook and an appendix with all relevant quantitative data on artificial receptors. Vladimir M. Mirsky is Professor at Lausitz University of Applied Sciences, Senftenberg, Germany. He graduated from Moscow Medical University in Biophysics and went on to study Physical Chemistry and Electrochemistry at the Frumkin Institute of Electrochemistry of the Soviet Academy of Sciences, obtaining there his PhD in 1986. He subsequently held an Alexander-von-Humboldt Research Fellowship and a research position at the CNRS Centre of Molecular Biology in France prior to joining the Institute of Analytical Chemistry, Chemical Sensors and Biosensors at Regensburg University in 1995. After habilitation he became Professor of Nanobiotechnology and moved to Lausitz. He is editor of two recent books, "Ultrathin Electrochemical Chemo- and Biosensors" and "Combinatorial Methods for Chemical and Biological Sensors". His work has led to about 20 patents and patent applications as well as 120 peer-reviewed scientifi c papers. Anatoly K. Yatsimirsky is Professor of Chemistry at the National Autonomous University of Mexico in Mexico City. He obtained his PhD and Dr. Sc. degrees from Moscow Lomonosov State University, where he was Professor prior to his move to Mexico in 1992. He spent Visiting Scholar/Professor stays at Milan University, Italy, in 1980/81 and at the University of California at Santa Barbara in 1998/99. His research is focused on physical organic chemistry and metal complex catalysis and he is the author of 160 peer-reviewed scientifi c publications including a monograph "Principles and Methods in Supramolecular Chemistry" by John Wiley & Sons and further book contributions.